Crush and mince garlic in a snap with a convenient garlic press. These tools will save your wrists and hands from strain while increasing output in your kitchen during prep hours. With a commercial garlic press, your staff won't have to struggle with mincing tiny garlic cloves with a knife. Simply place a clove in the press and squeeze the handles to produce finely chopped herbs. Many of these presses produce garlic in a very fine consistency, which helps the flavor disperse more evenly in your dish. Each garlic press is made of durable materials, like aluminum, aluminum alloy, or stainless steel. Thanks to their sturdy constructions, they can easily crush garlic without bending or becoming misshapen. Some presses can even cut several cloves at a time, saving you even more time when making flavorful dishes. The simple mesh design paired with prongs to push garlic through the mesh holes is easy to use and clean, for added convenience. 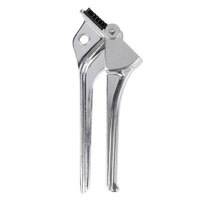 Good - Simplistic and durable, this garlic press is perfect for any restaurant looking for a sturdy instrument to get the job done right. Its die-cast aluminum handle also features an ergonomically designed handle to reduce slipping! 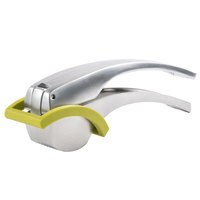 Better - This garlic press features a non-slip grip and ergonomic handle that makes it easy to use in any busy kitchen environment. 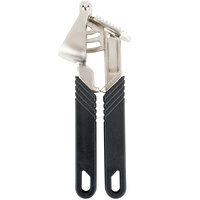 This garlic press is self-cleaning and dishwasher safe.